Children of parents suffering from cancer are subject to multiple stressors throughout the entire treatment period of the parents. They find themselves in a psychological stress situation due to the illness of their mother or father, which often only becomes apparent when behavioral disorders occur. The amount of persons concerned is quite high, since it is estimated that in the German-speaking countries alone, approximately 200,000 children per annum are affected by a parent's cancer disease. 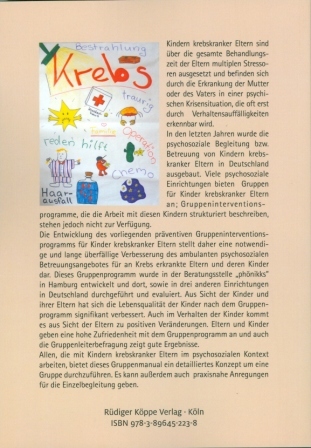 To accord these children psychosocial support, over the past years the counselling services for children of parents suffering from cancer have been extended in Germany and in nearly all psycho-social counselling centres for cancer patients, projects for the patient's children have been established. These new approaches also comply with the recommendation of the S3-guidelines for psycho-oncological diagnostics, counselling and treatment of adult cancer patients, which advises that cancer patients and their relatives should be granted easy access to support and counselling services which are located close to their place of residence and whose quality is assured. Romer et al. (2014) have recently submitted a manual for child-centred family counselling. However, descriptions of ambulant group programmes are scarce and rarely evaluated. The development of a preventive group intervention programme for children of parents suffering from cancer as it is provided in the present book is therefore a necessary and overdue improve­ment of ambulant psychosocial counselling services for cancer patients and their children. 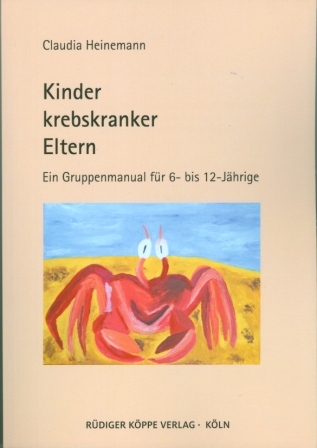 Following a short introduction to the issue and an account of the context of the counselling centre of the foundation phönikks in Hamburg, Germany, where the group programme was developed, chapter 2 of the book extensively discusses the situation of children of parents suffering from cancer. This is followed by a theoretical introduction to the topic „groups for children" which describes in detail the group programmes that were relevant for the development of the present group manual. Chapter 3 deals with the design of the group programme and presents its components as well as its goals and implementation. The centrepiece of the work, the group manual itself, is provided in chapter 4, which also includes a detailed description of the individual modules of the programme. In chapter 5, the evaluation of the group programme is given and its results are related to the theoretical findings. This group manual provides a detailed concept for carrying out practical group work to all those who are engaged with consulting children of parents suffering from cancer in a psychosocial context. It can be implemented in the suggested form to establish a new group, but it may as well serve as a stimulus to address particular issues and goals within the framework of already existing groups. Furthermore, it offers practical ideas for the individual counselling of children of parents suffering from cancer.